Home » Blog » SPONSORED POSTS » REVIEWS » PRODUCTS » I NEED A HERO! DO YOU? Sometimes we all need a hero, don’t we? Someone to come to our rescue and take care of the things that we just don’t have the time or maybe the ability to take care of. When you’re a caregiver you have more of those things on your list than you care to admit and anything that can scratch one of them off of that list is considered an absolute Godsend. 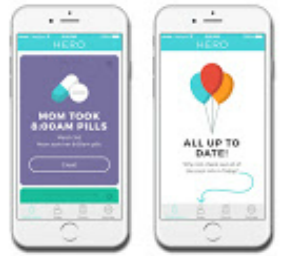 Well, now there’s HERO (herohealth.com), a smart appliance that manages medicine for you and your loved ones. As you know, I’m always on the hunt for anything that will make life as a caregiver just a little easier especially when it comes to managing our health care. I’ve been talking about getting into a care management program for the doctors and health insurance help, but there are all kinds of ways to manage your healthcare. One thing that can quickly get out of control is prescription medicines, even vitamins. Take a couple of months ago for instance, Hubby had the flu, I had the flu, and while momma didn’t have it she still had her regular medicine to take. I went to the doctor and he gave me one of those stupid math quiz prescriptions. You know what I’m talking about right? I hate those things. Take 3 pills and jump on your left foot today and tomorrow take two and jump on your right. I’m sorry, but when I am lying face-first in the bathroom floor I can’t count how many pills I took yesterday and subtract how many you want me to take today. I wasn’t even conscious enough to make sure momma actually swallowed her medicine instead of leaving it lying around the house in some random vase or bowl. I spend part of every day chasing her around with a glass of water and the other half looking for her purse, or shoes, or glasses. You get the picture, ain’t nobody got time for that! So, when I was contacted by the makers of a brand new medicine dispenser aptly named “Hero” I was very excited to hear more about it. Here’s the scoop! It’s a medicine dispenser, but it’s not like the dispenser that we’ve been stuck with for the last 40 years. You know, the one’s where you drop your pills all over the floor trying to fill the tiny little squares that only hold three pills and that’s only if they happen to fall in perfectly like lincoln logs. This is a home appliance that can store up to 10 different kinds of pills which you can then set up different times for different family members. It then dispenses it to them at the correct time AND it monitors their intake! That would be a huge time saver, but the added features are what caught my eye. There is an APP that is available for both IOS and Android where you can set up reminders. There is even an alert that will tell you if your loved one has missed a dose. This would be amazing for busy caregivers that aren’t in the same home as their loved one or at work. Think about it, you’re in your office and you get an alert that says your mom has forgotten to take her medicine. That alert gives you the time to react, make a quick phone call, before an emergency can occur and that’s always a good thing. I haven’t tried it out yet since it will be shipping in early summer. I was hired to help spread the word about this awesome new product. If you go to their site HeroHealth.com they have some terrific videos and it’s also where you can pre-order your very own HERO! Right now, they are on pre-order for $599, but they are expected to go as high as $999. If you order it now though, you also get a three-month trial to HERO Connect. Let me know what you think about the idea of an appliance like this? Would it benefit you? **This is a compensated post, but all ideas and comments are completely my own! I need a hero but of a different sort 🙂 I have three people in my life who need exactly this sort of hero. Wow, sounds like a great product! I especially think it would be good for someone who you are not living with to make sure they are getting their medicine. I love to see new products like this to make life easier. But, I think that I would have to monitor it for awhile to have confidence that it is giving the correct medicine. I think the price is a little high, but if it works with no mistakes, then it may be worth it. As a gerontologist, I have attended network meetings in Wichita for people in elder care, and I’ve seen some fancy pill dispensers. But this is a version I haven’t seen. Cool features. Thanks for the product overview. This is brilliant! A safety net, time saver and helper extraordinaire. I am so checking this out! Nice features, but the price…yikes. It’s a problem I definitely struggle with as well. I hope this eases your load once it comes out. Clever product. Wow, this is pretty complex! I wonder if insurance will cover it for certain patients? I would be interested in finding that out as well. This is a brilliant idea, and it seems like the way of the future. And now I have the “I need a hero” song stuck in my head :)! It’s definitely futuristic, Sorry about the song! What a great product. I know someone who would benefit from this! I think it’s definitely going to help aot of people! What a fantastic idea. Thanks for sharing it Rena! So glad that no one in my family has to take any kind of any medication for as long as I can remember. I feel so sorry for people that have meds and can’t imagine having to take so many they would need a dispenser. But it certainly looks like a amazing little hero for those who need that. Carol Graham recently posted…Do You Have Trouble Finishing What You Started? It’s definitely hard when you have so many to keep track of, you are very blessed! This is a game-changer! Amazing! I hope you never need it as well, I am very glad it is there to help with the chaos in our house. I love hearing about new products that fix a problem in an ingenious way. And you are the perfect spokesperson for this. Good for everyone! That would be an amazing help to many caregivers. Good to know about it … just in case. We have the classic ones also, Can’t wait to try this one out!